"Natural selection can preserve innovations, but it cannot create them. Nature's many innovations-some uncannily perfect-call for natural principles that accelerate life's ability to innovate, its innovability." Darwin's theory of natural selection explains how useful adaptations are preserved over time. But the biggest mystery about evolution eluded him. As genetics pioneer Hugo de Vries put it, "natural selection may explain the survival of the fittest, but it cannot explain the arrival of the fittest." Can random mutations over a mere 3.8 billion years really be responsible for wings, eyeballs, knees, camouflage, lactose digestion, photosynthesis, and the rest of nature's creative marvels? And if the answer is no, what is the mechanism that explains evolution's speed and efficiency? Consider the Arctic cod, a fish that lives and thrives within six degrees of the North Pole, in waters that regularly fall below 0 degrees. At that temperature, the internal fluids of most organisms turn into ice crystals. And yet, the arctic cod survives by producing proteins that lower the freezing temperature of its body fluids, much like antifreeze does for a car's engine coolant. The invention of those proteins is an archetypal example of nature's enormous powers of creativity. 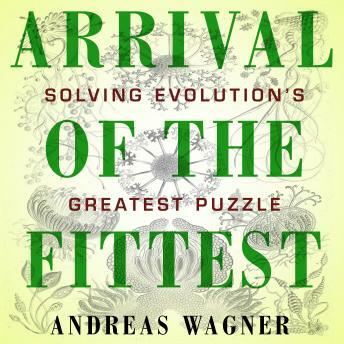 Meticulously researched, carefully argued, evocatively written, and full of fascinating examples from the animal kingdom, Arrival of the Fittest offers up the final puzzle piece in the mystery of life's rich diversity.